I can now confirm that the reason why the CIA could not locate its file on Noam Chomsky, despite the fact that the CIA had in fact maintained records on him, is that the CIA destroyed them and, unfortunately in my view, the destruction was authorized by the Archivist of the United States. 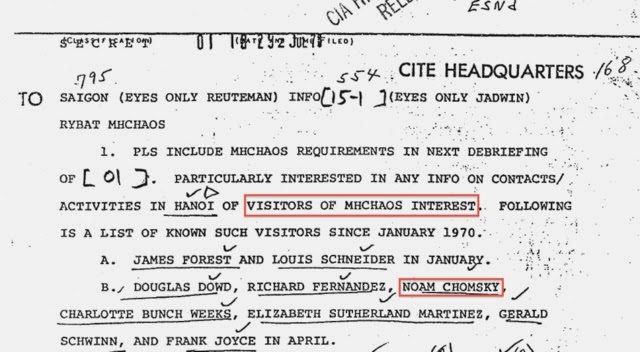 As background, in an earlier post "More CIA Records on Noam Chomsky the CIA Could Not Find" I analyzed some additional CIA records (see, e.g., here from 1967, here, here, and here from 1970, and here from 1971) showing that the CIA was documenting the activities of Noam Chomsky as part of the CIA's CHAOS/MHCHAOS program. Importantly, those documents were located in the "Segregated Collection" of CIA records that were provided to the House Select Committee on Assassinations established in 1976 to investigate the assassinations of JFK and MLK, which are available in full-text search from the Mary Ferrell Foundation. My post was a follow-up to John Hudson's earlier piece in Foreign Policy called "Exclusive: After Multiple Denials, CIA Admits to Snooping on Noam Chomsky" that was based on a CIA document obtained via a FOIA request to the FBI by Kel McClanahan at National Security Counselors on behalf of Chomsky biographer Fredric Maxwell after the CIA had repeatedly denied possession any such records. The new piece of the puzzle, just obtained via FOIA, is this CIA records control schedule, NC1-263-78-1, signed by then Archivist James B. Rhoads in March 1978 approving a "Request for immediate disposal" of thousands of CIA files on U.S. citizens "and the index related to these collections which were established under project CHAOS during the period 1967-1974." The schedule notes that the "files were opened to maintain information bearing on possible foreign Communist exploitation of dissention in the United States, primarily concerning the Vietnam War. Subject of the folders were U.S. citizens and organizations involved in dissident activities in the United States." The schedule actually quantifies these files noting there were "8,328 folders on individual U.S. persons (citizens, resident aliens) and 2,196 volumes consisting of official and 'soft' subject files and so-called sensitive files (i.e., organizations/activities)." The CIA only requested immediate destruction of 7,840 of the files and was retaining the other 488, because it had deemed them to be of "continuing foreign intelligence or counter-intelligence interest." The schedule also excludes records that were, at the time, subject to FOIA or Privacy Act requests. The schedule explains why the CIA denied having any such records and why the CIA records on Chomsky have been found in collections outside the CIA. Moreover, on its face, this approved records schedule made the destruction of the records consistent with the procedure outlined in the statutes collectively referred to as the Federal Records Act (although it is not conclusive as courts can, and have, found that even records schedules fail to comply with the federal records laws (see, e.g., American Friends Serv. Comm. v. Webster, 720 F.2d 29, 65-67 (D.C. Cir. 1983)). The bigger issue, as I suggested in my earlier post, is that the incomplete story of the CIA's creation, maintenance, and then destruction of its Noam Chomsky file highlights yet again a crucial question that needs attention and discussion in the ongoing debate over NSA surveillance files (previously discussed here). Namely, the drive for "purging" surveillance data and "minimization" procedures purportedly designed to "protect privacy" needs to be balanced against the value of retaining government surveillance files (or some portion thereof) for long-term accountability purposes. We now know that the CIA destroyed its file on Noam Chomsky based on a records schedule that cites the Privacy Act as justification, but that destruction also had the effect of creating, for years, the false impression that the CIA had never had such a file in the first place. There has to be a middle path that both protects privacy and also preserves accountability. Chomsky is a damn gatekeeper. The files they destroyed were probably the ones which proves that he worked for them, in my opinon. Someone listens to Alex Jones. Among many great pieces about the Janus-like nature of archives as both tools of oppression and tools of redress that oppression is Eric Ketelaar's "Archival Temples, Archival Prisons: Modes of Power and Protection" (Archival Science 2: 221–238, 2002, freely available from his website by Googling the title). The quote below from the abstract sums it up well, but it's worth noting that he specifically recommends that records in time of upheaval deserve special consideration outside normal record schedules and normal scheduled destruction. "Archives resemble temples as institutions of surveillance and power architecturally, but they also function as such, because the panoptical archive disciplines and controls through knowledge-power. Inside the archives, the rituals, surveillance, and discipline serve to maintain the power of the archives and the archivist. But the archives’ power is (or should be) the citizen’s power too. The violation of human rights is documented in the archives and the citizen who defends himself appeals to the archives." Kevin, thanks for the citation, will definitely read!